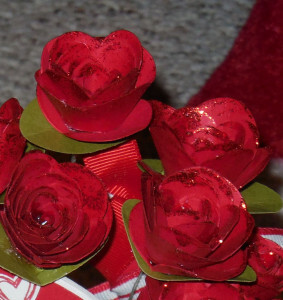 Home 3D Item Roses for Valentine’s? Cut a piece of real red card stock to 4″ x 4″. Run the die through your Big Shot to cut out the spirals. 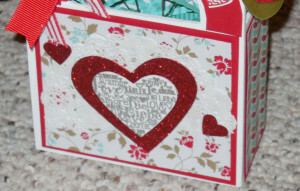 Use a bone folder to break down the stiffness of the card stock. You want the card stock to be more pliable. Cut a 12″ piece of wire. With a pair of pliers, bend over one end of the wire to make a loop on the end. This becomes the center of the flower. Wrap the narrow end of the spiral around the loop of the wire and pinch with your fingers. Begin to wind around while pinching the bottom. 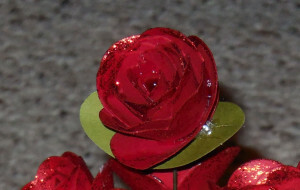 Use a dot of hot glue to hold the bottom together as you are wrapping around. There is a tab at the larger end of the spiral. This becomes the bottom of the flower. I put a dab of hot glue in the center to hold the whole thing together. Cut narrow strips of pool party card stock. Run through a crimper and add to the container. Voila! 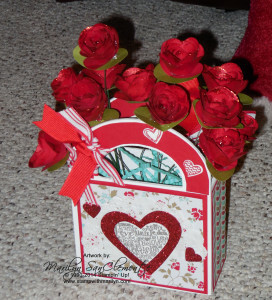 You have your container of roses! Enjoy!